80's Punky, Performance Art Cabaret, featuring red-hot vocals and quirky songs about everything from PeepingToms to Cybernauts. 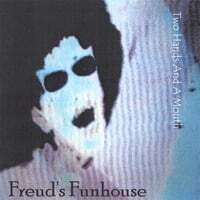 If you like 80’s performance art, Danny Elfman’s Oingo Boingo and Kate Bush, you’ll love Freud’s Funhouse! Wacky and irreverent, this quirky collection of song-stories will take you from the Bavarian Beer Hall waltz of Pansy to herky-jerky kazoo solos in Xray Eyes, to the ethereal Sci-Fi ballad Cybernetic Man. Add great vocals with punky-funky musicianship and you’ve got a view into the underbelly of society that’s Freud’s Funhouse. Musically eclectic, Freud’s Funhouse carries you into the world of insane asylums, peeping toms and aliens posing as humans. A bit off-kilter, this CD will amuse and entertain those who want to hear something a bit off center!